Who doesn’t love fairy tales? Some may think that this is a strictly girly topic, but we strongly disagree. Fairy tales inspire us all, regardless of gender, age, and views. Most times in life we don’t get to see the happy ending, and love doesn’t conquer it all, but in fairy tales happiness, joy, and justice are granted, which is always a nice break from reality. Nevertheless, we can all build our own fairy tale, write our own scenario, and most importantly – pick the protagonist. Perhaps real-life fairy tales aren’t perfect, and as magical, but when shared with the right person, they can turn out to be even better. In every single fairy tale, we have the good and the bad, the virtues and the vices, the light and the darkness. The villains in fairy tales try to corrupt the virtuous, righteous protagonists, lure them into temptation, or destroy their happiness. On the other hand, positive characters in a fairy tale are fighting in the name of justice, love, friendship, and peace. In real life, we don’t live in fairy tale castles, fight dragons and mystical creatures, or make pacts with enchantresses, but we certainly do encounter challenges, temptations, and evil. We experience ups and downs and battles, and even though we don’t have magical powers or creatures from fairy tales by our side in these moments, those lucky enough have their own fairy mothers, princes and princesses. In fact, fairy tales aren’t that different from realistic stories, since the same principles apply. In both fairy tales and the real world, love is the essence of life, the true and only meaning, the biggest power, and the strongest motivation. It brings people together, settles their differences, and gives them the strength to overcome obstacles. Just like in fairy tales, in real life, too, after hardships we are bound to experience better times, and there is certainly a light at the end of the tunnel. And the best part about the fairy tale you’re living is that it is real, it belongs to you, and you get to share it with whomever you want! 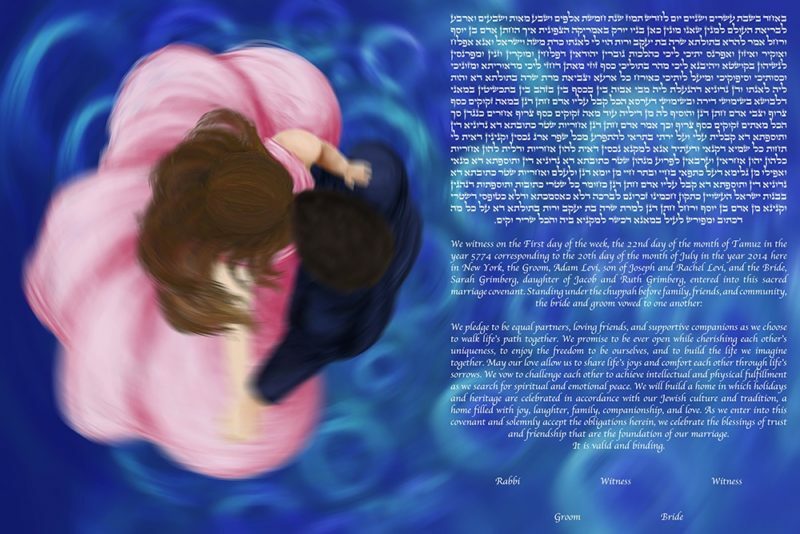 Once Upon a Dream ketubah is truly a magical, mesmerizing, enchanting fairy tale ketubah design, which has fairy tale written all over it. Inspired by Sleeping Beauty, the ultimate fairy tale we all love, it portrays a couple in love dancing in a ballroom. This ketubah design captures emotion, romance, and love between a couple who are enjoying their dance as if they were the only two people in the world – an emotion newlyweds can certainly relate to.